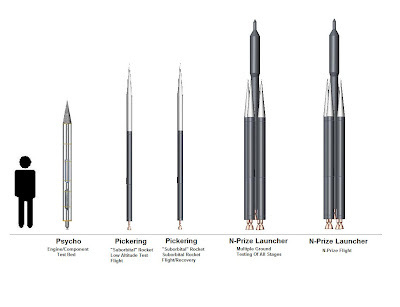 These rockets have not yet been constructed, but they do show a nice set of plans. 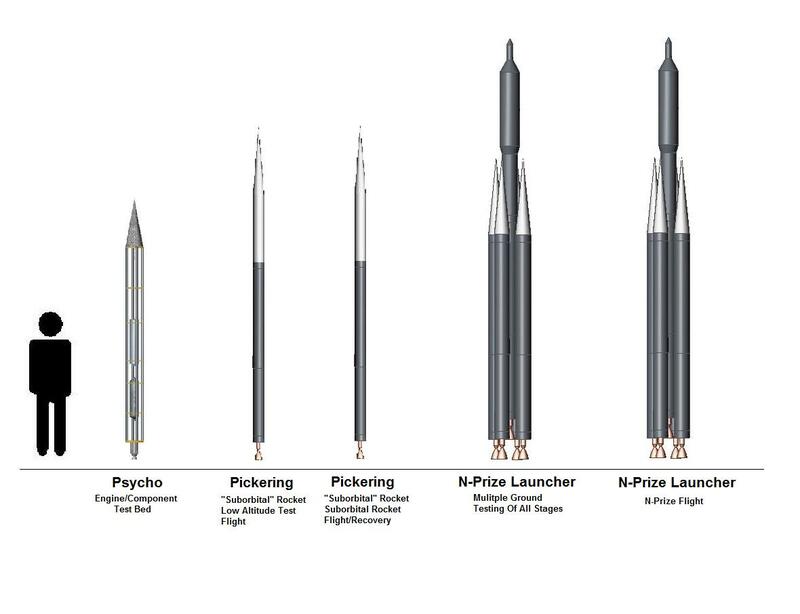 The Nprize rockets look good enough to get the job done, if they have 2 or 3 stages within that core module, and a good mass fraction. Just under 1 year left! There is a new, huge update from the LMR team. There is an extensive discussion of the practical limitations of a small orbital launch system, with real math! At the end, there are details on a $1000 prize open to "The first person who can prove clearly and to my satisfaction that a 120 kg GLOW launcher cannot put a 20 g payload into orbit (no matter how well it's built) will get $1000 cash." "Those of you who’ve read my earlier blog entry “Overview of the LMR N-Prize Approach” might be interested in the details of how my decisions and estimates were arrived at. I'm going to cover some of that thought process here; this will hopefully (also) shed some insight into the basic first-pass design of a multistage rocket system." Little Monster Rocket does not have specific plans, and has not updated this web page in over a year. The FAQ is detailed, however, and contains some interesting discussion. One key question is: "Is the N prize possible?" The authors say yes, comments say "show us the math." "First, a little about what we're not doing. We're not doing a balloon launch (rockoon), air launch, jet assisted booster, space plane, light gas gun, electromagnetic mass driver, space elevator, nuclear rocket, beamed power-craft, anti-gravity system, teleporter, or any of the more exotic launch concepts." "Each of our three(3) stages employs a single engine, with two(2)-axis control (gimbaled) – nothing fancy; no clustering. The system is fairly devoid of kludges: no variable thrust differential steering, exhaust vanes, or gas injection schemes; roll control is handled via simple gas jets. All engines are low pressure, including the booster. The third stage engine is roughly 30 psi chamber pressure (or potentially lower), the second stage roughly 60 psi; the booster will run at ~200 psi (or otherwise generally between 150 psi and 250 psi depending on certain experimental factors). The targeted specific impulse for the booster is estimated to be >220 s (sl), >230 s nominally; upper stages are both estimated at >270 s (vacuum). It would be incredible to see such a small rocket fly to orbit, or high altitudes at all. Looking forward to some images in the future!